This is a test of the prototype HDMI board for the Dreamcast. This has been uploaded at 60fps, and this is a true 60fps game. The HDMI board fits perfectly underneath the GD drive in the Dreamcast, providing the bottom shielding on the drive is removed first. The main board shielding / heatsink can be put back in place now too. It will eventually also be used for many other retro machines, like the GameCube and N64 (see my other vids), Atari Jaguar, PS1, PS2, 3DO, NeoGeo (MVS/AES/CD), Amiga, and many more. It could also be used with handhelds, like the Game Gear and Atari Lynx, and with other things like video processors / scalers. 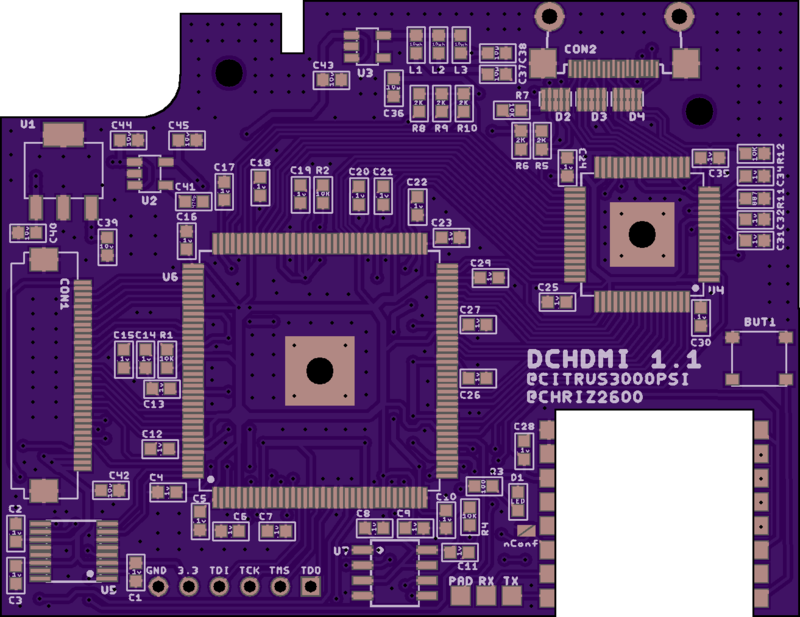 The PCB layout itself is being designed by a talented guy by the name of [RDC]. He's nearly finished the main board now, and it will be a few weeks until weeks before we have a few final prototypes for testing. There are still some things to be worked on, so you might notice some slightly strange colours in the video, and some colour banding here and there, but you can see the quality is already very good. Along with the benefits of the best possible picture, it will be more convenient to connect to modern TVs, as many of them are now doing away with "legacy" analog inputs altogether. The HDMI board has the digital audio from the Dreamcast hooked up to it too, so that will be passed directly to any modern TV with HDMI input. The Dreamcast outputs a resolution of 640x480 for 99% of it's games. Depending on the TV or monitor, this board may require some games to be patched for 60Hz "VGA mode", but almost all games should work. No ETA on when this will be ready, as the mod itself is quite tricky, and we need to make changes to the board design then get more PCBs made. Looking forward to this! It probably won't look any better than VGA but for convenience alone it should be a great upgrade. I guess it would require more work and would cost more, than simply getting an Akura HDMI box from BeharBros. I just finished up a second revision (still protos) last week. There is a QSB that grabs the digital signals and a FFC cables runs to the bottom side of the motherboard, where the main board will sit. This project will be open source as well. To me it would be handier if it had 240p 15,6 kHz line doubling to 480p 31,2 kHz, to enable 240p games to be played over HDMI, on screens that don't support those 240p 15,6 kHz games, that can't be tricked to be played over VGA no matter what, but I guess it would require more complex work. OSSC or Framemeister are the way to go on those cases. Raen wrote: To me it would be handier if it had 240p 15,6 kHz line doubling to 480p 31,2 kHz, to enable 240p games to be played over HDMI, on screens that don't support those 240p 15,6 kHz games, that can't be tricked to be played over VGA no matter what, but I guess it would require more complex work. OSSC or Framemeister are the way to go on those cases. It does also line doubles 240p as well. Sorry didn't list up there. In that case, it's something worth looking into, as the OSSC and Framemeister cost around 200 € or more. Looking very promising citrus3000psi! Besides getting native HDMI-out, Im especially excited for getting a digital audio feed too! Wow! This is actually a mod I want to do! Will you offer populated PCB? I will probably do something similar to my Gamecube mod. Offer installs and pre populated kits. Not sure how many kits I will make. As this is hobby for me. I'm also going to try an FFC cable like the ultrahdmi for the n64. The current QSB with castellation holes works, but its not without its issues, since its hooking up to .65mm spaced pins. I already have an FFC cable designed up and have sent it to fab. Cost 125 bucks just for 9. Here's to hoping it works without many revisions. Is it possible to add an audio track to Ecco prototype? The topic that was on Assemblergames has moved over to shmups form about the internal Dreamcast HDMI board mod. Looks like an easier way to do the HDD mod, thought I'd share.